There’s a theory about parallel universes. Without getting too deep, it’s simply that alongside our perceived reality exists another, different one. The Gunther Werks 400R embodies this concept; it’s as though Porsche hadn’t built the 996 after the 993, and had instead continued to develop its air-cooled model to this day. The combination of the sheer volume built and the fact that the air-cooled cars’ basic structure remained largely the same, means the model has long been the recipient of modification, re-creation, outlawing and backdating in order to evoke the marque’s most successful racers and special models. As a result, there are undoubtedly more R, RS, ST and RSR evocations than Porsche ever built. The 911 is the sports car equivalent of a Lego brick for its owner’s particular predilection, then – although any reworking is more usually a retrospective nod to the past than any desire to chase a potential future. Looking to buy a classic 911? Plenty here! The Gunther Werks 400R is an exception, as it turns that idea around. Instead of evoking Porsche’s historic icons, it takes the last of the air-cooled line and extends it forward. A continuation if you like – although not merely of the Carrera, but as if the manufacturer itself had developed the 993 into a GT3. Forget the 996, 997 and 991-series cars; the Gunther Werks is the firm’s take on a modern 911. Only here there’s no water in the mix, as this 993 makes the most of modern technology to enhance and improve, without removing the essence of what makes Porsche’s older 911s so enjoyable to drive. To achieve that, California-based Gunther Werks has applied some of the best minds in the old Porsche world to create its vision of a modern one. The idea itself was Peter Nam’s, whose company Vorsteiner is known for alloy wheel and aero kits for premium and sports cars, as well as its extensive expertise in carbon fibre prototyping and production. Gunther Werks, then, takes care of the build, although it tasked Rothsport owner Jeff Gamroth to build the engine, while Joey Seely from E-Motion Engineering and Carey Eisenloher are responsible for the chassis. If you know your US air-cooled experts then you’ll undoubtedly recognise the names, as Nam picked an A-list to create the 400R. 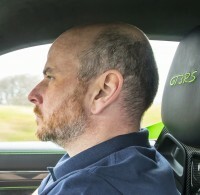 Not that he gave them much time, mind you, as the project was transformed from a seed of an idea into the car I’m sitting inside today within just six months. Given that timeline you could forgive it the odd cut corner, but there are none. The execution is exemplary. The attention to detail is sensational, while lifting the bonnet reveals the carbon weave that’s used on every panel including the roof. Only the doors remain magnetic, closing with that same satisfying click that will be familiar if you’ve ever experienced a vintage 911. The use of carbon fibre is for weight saving, but the fact that it looks sensational where it’s not painted is not entirely unwelcome. In fact, one buyer has gone for an entirely visual carbon body. On ‘standard’ models, you can see the material in the interior, with carbon panels featuring where the rear seats once were. If you want these items back, however, Gunther Werks is happy to oblige. The specialist will build just 25 examples of the car, with each individually specified to its owner’s exacting specifications. That the company sold almost that entire run during the model’s first outing at The Quail underlines not only the quality of the work, but the respect garnered by the names behind the project. As with the modern GT3 it apes, there’s purpose in every element. The superfluous has been deleted in a bid to create the most engaging, appealing driver’s car around. It weighs in at around 1200kg, and that mass is shifted by a 4.0-litre engine that, like the body, is a sight to behold. The powerplant uses little more from the 993 than its crankcase, with Gamroth admitting that virtually everything is bespoke. Inside that incredible-looking engine is a crank from a GT3 4.0 RS, a GT3 oil pump, custom-forged con-rods from Carrillo, Mahle pistons, UK-sourced cylinders and custom cylinder heads with a Gamroth-spec port design. The camshafts are made by Dema Elgin, and there’s a GT3 centre-section silencer, Gamroth-designed fuel injection, Jenvey cast throttle bodies and a dual-map-capable Motec ECU controlling it all. With the big capacity and stroke there could be issues with harmonics, so there’s a vibration damper on the crankshaft, while the intake system features an Eventuri air intake. Even the fan is bespoke, it’s Turbo-sized in diameter with its vaned design created by some GE Aviation engine engineers in their downtime. Given that the oil circulating around that 4.0-litre flat-six has a lot of cooling to do, there is a pair of oil coolers situated behind the front bumper, and a vented oil catch tank in the rear. The output is 431bhp at a heady 7800rpm and 427Nm of torque at 6500rpm, for an impressive specific output of 107.7bhp per litre. If the engine’s artistry is apparent in the visual treat it provides when you open the lightweight, winged engine cover, there’s no such giveaway with the suspension. Only the expansive wheelarches hint at the development goals. These are, quite simply, a square 1600mm track front and rear, sitting on 18-inch three-piece alloys, with 245/35 and 315/30-section Michelin tyres all round. The 400R’s body seduces, its curvaceous 993 lines being dialled up significantly in line with its GT3 ambitions. The panel gaps around the nose do without aging rubbing strips, while the unique headlights add modernity without looking in any way incongruous. That modern, classic mix is apparent inside as well. It’s all very familiar air-cooled 911, slim pillared and airy, with an upright windscreen and five clear dials ahead. There’s a Porsche Classic Nav for smartphone connectivity and route finding, and the only other button is for another type of map – the engine and exhaust one – allowing for a calmer, quieter 400R. There’s a front-axle lift, too, allowing that low nose some distance between it and the speed humps littering the roads. Escaping these spoilers of fun is where the 400R reveals its real character. Easy as it is to be won over by the car’s looks and specification, the 400R actually delivers on its promise on real roads. The engine sounds magnificent, the single-mass flywheel helping it rev with ferocity, and it’s all the better for blipped downshifts when standing on the six-piston Brembo brakes before a canyon road takes a turn. It’s a feel that defines the 400R, taking a 993 to a different level. The car retains the detail of an older 911, yet adds some sophistication and, yes, some real GT3 character. That’s the clever trick; the 400R delivers an intoxicating, clear feel that’s been largely lost with modern cars, yet adds utterly contemporary performance to it. That rich mix is apparent in every facet of its make up, from the faithfulness, immediacy and weighting of the steering, to the throttle’s responsiveness and the strength of the brakes. The engine is so charismatic, arresting in tone and demanding of revs that it absolutely absorbs you. If there’s a slight failing, it’s low-down response. Gunther Werks admits it’s looking at adding a little lower-rev responsiveness, or shorter initial gearing to improve sub-4000rpm pick-up. That said, the chase is arguably part of the appeal. The input-to-reward ratio is where this car delivers, it feeling like you’re part of the equation rather than merely a paddle-shifted, electronically managed passenger. The 400R is analogue. There’s satisfaction every time you shift the six-speed manual, while blipped downshifts are a joy. The engagement and fun gained by your measured, precise inputs are matched by feeling how the car reacts to them. That chassis provides a sensational platform for the stunning 4.0-litre to do its thing. The suspension’s set-up is instrumental, it riding with a civility that’s in contrast to its clear focus – a result of Seely’s aim of allowing the dampers to do their job. The wide track facilitates the turn-in response, removing any rollover effect from the rear, with both axles feeling like they’re working beautifully in unison. No other air-cooled 911 I’ve driven has had a nose that feels so utterly planted. Get beyond the limits of grip and traction, and the 400R faithfully reveals what’s going on – to the point where it can be exploited and enjoyed. Nam’s goals were clear, and after a day with the 400R among some of California’s finest canyon roads, it’s clear to me that they’ve been reached. Exceeded, even. That the 400R is able to deliver such contemporary performance and, crucially, usability, while delivering the sort of fine, nuanced detail that defines the most absorbing, engaging classics is hugely impressive. That it brings the past to the present, adding and improving while retaining all that makes so many gravitate towards older cars, is even more appealing. The 25 owners are very lucky indeed.